Learn about the correct type of soil to start your seedlings in. Why to add a slow release earth mineral fertilizer and mycorhizzae. We will also cover lighting, correct temperature for germination, using a fan to strengthen seedlings, hardening off your seedlings, and transplanting them. Bring your pruners and gloves, this is a hands-on pruning class. 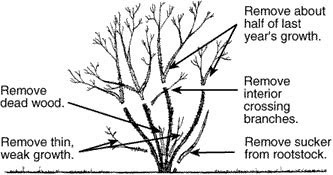 Pruning should be looked at as applying a few common-sense principles to accomplish several tasks. When starting seedlings, we add a small amount of StarDust for Greens. This will help your seedling once it sprouts. StarDust Organic Plant Food is made locally by Osage Gardens. StarDust is made of USDA Organic mineral ingredients and Alpha One (a, alfalfa based Nitrogen source. The mineral components are Mother Natures time released fertilizer. They come from the Earth and are released slowly back into your garden. Kelp Meal – Small amounts of N, P, and K (highest in K) but adds micronutrients, growth hormones (natural), and vitamins that help increase yields, improve soil structure, reduce plant stress from drought, and increase frost tolerance. Alpha-One – (N) Nitrogen, (P) Phosphate, (K) Potassium, Organic Matter, Humic Acid, pH 6.2. Manufactured in Colo for Colo soils. In fact, many plants will trade more than 50% of their carbohydrates with these fungi and other microbes. Mycorrhizal fungi greatly improves soil characteristics and are among the most important microbes that form relationships with plants. The best time to apply mycorrhizal inoculant is at planting/seeding.